London: Artists and Subjects, Portraits: British 20th C 23 comments Do you know who painted Charles Brehmer Heald (1882–1974)? Previously 'Portrait of an Unknown Rheumatologist', we have now found out who the sitter is, but can we find out who the artist is? My tentative suggestion would be Francis Edwin Hodge (1883-1949), who was working at the right sort of time in a free, French-influenced light-toned manner influenced by his teachers Brangwyn, John and Orpen. He painted a number of prominent medical figures, mainly from the Royal College of Surgeons. 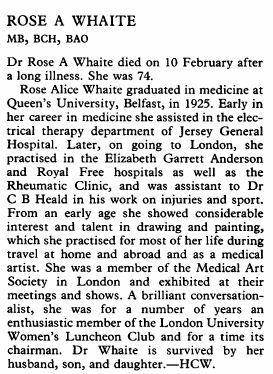 Interestingly Heald's assistant was an amateur artist (see attachment from the British Medical Journal March 12th 1977). A few of her watercolours seem to have been on ebay recently, though not really sufficient for a decent comparison. I'm doubtful the portrait is by her, but I suppose it's a possibility at least. Rose was a watercolourist, not an oil painter, I believe, but her husband, Henry Clarence Whaite (1895-1978), a few of whose pictures can be seen on Your Paintings, was a painter in oils, and at one time an assistant to Henry Tonks. We are not aware that he painted portraits, but Art Detective experts may wish at least to confirm excluding him from consideration. They lived in Hampstead for many years. By the way Clarence (Rose called him Henry) was the obituarist of the piece found by Tim Williams. Gillian Whaite, their daughter, has one picture on Your Paintings. Unfortunately both the Whaites' offspring have passed away, and had no children, so we cannot consult them. I've skimmed through it but can't see anything (pages 47-66 are the main catalogue listings). "I have checked the catalogue entry for C B Heald’s autobiography, which is reasonably detailed. Unfortunately, I can find no reference there to his portrait. My feeling is that if the memoir had mentioned this, the cataloguer would probably have recorded the fact." It seems unlikely that the information of how this portrait came to be is there - though there might be other leads gained from digesting the unpublished autobiography - could be a good read! Potential small publshing project for the Royal Free & University of Manchester perhaps? The painting of the head and the background remind me of the work of Arnold Mason (1885-1963) but the painting of the torso and arms do not. They are much more 'impressionistic' and lacking in detail than I would expect. Perhaps just something not finish it in his usual fashion. So could this possibly be an unfinished portrait by Arnold Mason? If it's unfinished, that would explain why it isn't signed. Very few portraits by Francis Edwin Hodge (1883–1949) have such dull backgrounds, one might assume that he indulged the background with the detail, and tho’ the portrait of Heald is entirely competent and not particularly amateur, it is distinctly short on detail. From the images on Art UK’s site, Hodge has generally speaking a much lighter, at times even hesitant touch than that exhibited in the Heald portrait. Arnold Mason (1885–1963), whose work is altogether rather knowing, seems from the image evidence on Art UK to be even less likely a candidate. But both are of the period and worth having been pursued. I would suggest that the stiff attached collar and tie, central hair parting and moustache suggest a date earlier than the First World War, and so possibly an artist born earlier than either Hodge or Mason. 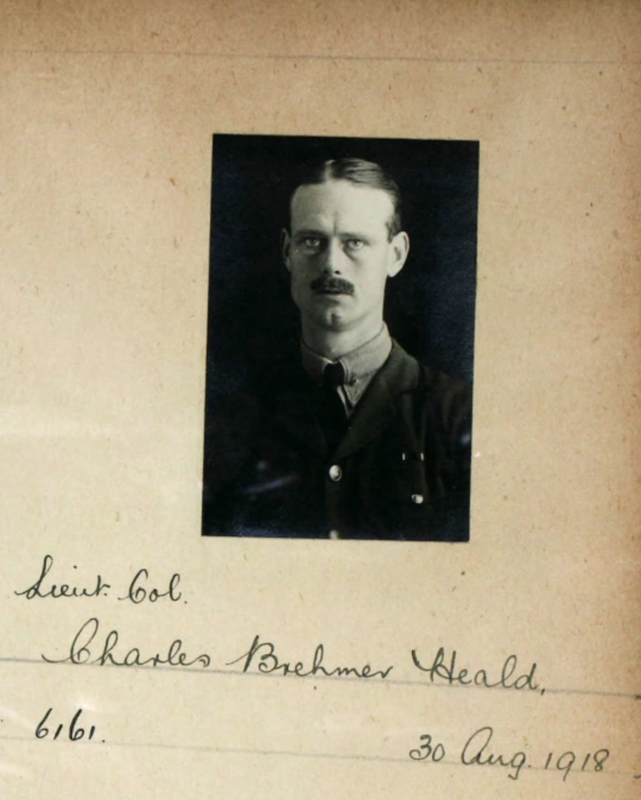 In 1920–1925, the date given for the portrait, Heald would have been 38 to 43, and for someone who had been through the entire war as a medical officer, he looks surprisingly young. We are again in the unsound territory of comparing images with images, and unless further documentation can be found, this is stalemate. The Royal Free Hospital does not say how the portrait was acquired nor yet how the attribution of the sitter as Heald came about, or why they have the date they do for his portrait. Is there any information on the back of the portrait such as exhibition labels, canvas stamps, etc.? Is it likely that it was commissioned by the Royal Free? Was it given by a member of the family? Was he a Rheumatologist? Is that another way of describing the specialism of physical medicine? Have they been through the personal papers, letters, etc. in the National Maritime Museum? This discussion has hung fire for over a year, and I am now asked to close it. I raise a number of questions, however, which if the Royal Free can provide answers would open the case once more. I'm sorry not to have turned my attention to this discussion (or its predecessor) before; but I would certainly now ask for it to be left open, as after a lot of biographical and genealogical delving today I may have come up with a family lead. I've managed to track down some grandchildren of Charles Brehmer Heald, and at least one of these - a son of the youngest of Heald's three daughters, Audrey (1920-2011) - looks, prima facie, to be the sort of man who might be able to help: he is a former museum director of distinction, and has written an eloquent and informative memoir of his step-grandfather on his father's side. I've even found an email address, and am writing to him now; until I hear back, however, I will leave him anonymous. Interesting to see that before the First War he did post-grad work in both SW Germany and Sweden - not my area at all, but is a German or Scandinavian artist a possibility (assuming it is, as Katharine rightly suggests, pre-war)? **Sorry, I now see a lot of extra biographical information was covered in the previous discussion - the link to it (which I'd missed) is at the top right of this page. The collection have been contacted regarding the recent comments on this discussion. The Royal Free Hospital indicate they have no further information than that provided when this discussion started, and would request that the discussion is left open for now. Pat Hardy also posted there some more images of both front and rear taken when she and Martin went to see the portrait. (Incidentally, Martin - was there any sign it had been cut down?) The only clue on the back is the furniture remover's label, and being on the frame it's impossible to know how long it's been associated with the picture: the firm was Biddick & Co of Bridgwater & Burnham-on-Sea. It has been suggested the label might relate to W. Biddick, a frame maker in the Caledonian Road. 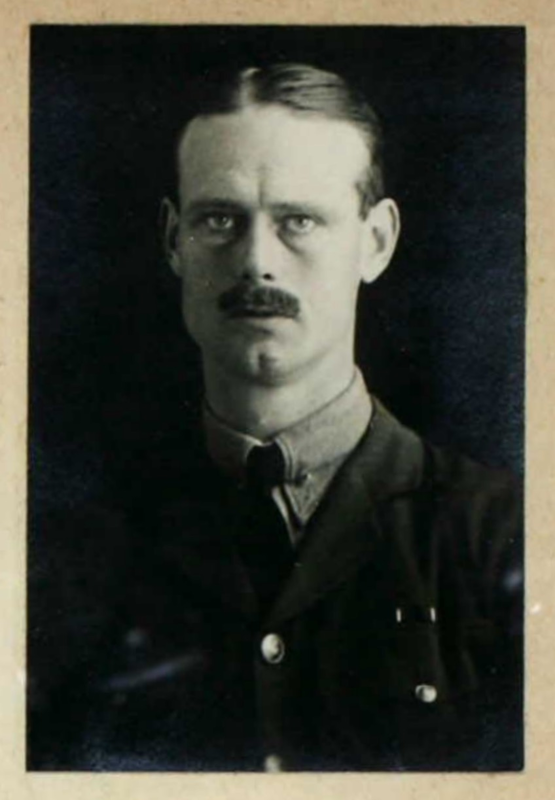 I have tracked down this framer, Wallace Edward Biddick (1886-1963), who was the son of a Cornish-born butler. Wallace probably worked for the well-known Joseph Tanous pre-WW1 before setting up on his own c1915 and continuing at the same London address until 1940. However it is now clear that he was unconnected with the Somerset firm of Biddick & Co, who traded as remover-storers (and much else) at Bridgwater & Burnham from at least 1912 until 1960. So the label is just what it seems - evidence of it having been stored in that neck of the woods, and from the typeface probably well before WW2 (though I am no expert). I have received a hugely helpful reply from my Heald grandson, who knew nothing of the portrait (which he confirms is beyond question his mother's father, whom he knew well). He has provided much personal detail that is of great interest and some relevance, but will look for anything else - especially photos from the period that may help us pin down the date. Here is an extract: "I agree with the notes on the first link [to the first discussion] you give ... that this can have been painted no later than about 1920. He was always a conservative dresser, so it is entirely possible that he was dressing as a gentleman not up with the latest fashion! He looks very young: my hunch is that it was painted just before WWI [as Katharine suggests]: but would he have advanced so far up the tree, medically, to have had a portrait commissioned at that stage in his career? I wonder if his distinguished war record (and his survival) might have merited that attention in 1919? All mere conjecture. I will see if I can find anything in the suitcase that might shed light." I will report back on any further developments, and probably attach a copy of his full email once I've cleared it with him. I've also asked him if any family member he knows of lived in the Bridgwater area. Yes, the John Rylands Library material will certainly be of great interest - my family contact also drew my attention to them. Re the painting, though, Tim Williams reported a year or more ago (above) that the archivist at Manchester had checked the catalogue entry for Heald’s autobiography (which he described as "reasonably detailed"), but could find no reference there to his portrait. He felt that "if the memoir had mentioned this, the cataloguer would probably have recorded the fact." It is still possible that the other papers, if not the memoir, may refer to the portrait - or perhaps mention an artistic acquaintance (though my correspondent notes that Dr Heald was "entirely ignorant of the fine arts ... and uninterested in the visual arts"). But it looks like any clues from the archive would have to be dug out the hard way - and I'm not sure who's likely to get stuck into that any time soon. There is a 'boxlist' of the archive's contents here : http://bit.ly/2eOTlop . Boxes 7, 8, 13 & 18 seem to contain the most directly relevant C.B. Heald material (including letters and contemporary photos), along with nos. 10 & 11 which contain his mother's diaries 1912-1926. The catalogue for the autobiog is not viewable online, as far as I can see. of his Royal Aero Club Aviator's Certificate. It is dated August 31st 1918. Thought it could possibly help with dates. It is interesting to compare it to the painting. He has aged a little but it is the loss of innocence in his face that I find most striking. Hopefully someone might suggest an attribution! I would also suggest that contact with surviving Heald family members might provide a valuable lead. Maybe the artist was a friend of Heald. Thank you for the interesting artist suggestions, Mr Buckman (or "Please pass on our thanks to Mr Buckman, Edward, for..."). I'm not familiar with any of them except de Laszlo and Dugdale; but with the exception of the former, all seem prima facie to be plausible. Like you, I feel that de Laszlo can be rejected on stylistic grounds - and he invariably signed even his wonderful 'two hour' sketches. The family has already been contacted, as you can see if you read the three fairly extensive posts by me just a few above yours. The grandson I am (or was) in touch with was immensely helpful, but at that time unable to come up with anything concrete to help us with an artist (though he was still looking). I previously (see above) floated the idea of an artistic acquaintance; but though not impossible, it is perhaps less likely in view of the information I was given that Dr Heald was "entirely ignorant of the fine arts ... and uninterested in the visual arts". As promised a year ago (sorry, I forgot), I will shortly post more substantial extracts from my email exchange with Heald's grandson, in which he gives a lot of interesting personal / biographical information about him. Before I do that I'll get in touch with him again to see if he's come up with anything else, and also to check he doesn't mind me quoting him at greater length. Could William Orpen be a contender? He was a star pupil of Henry Tonks when the latter taught at the Slade, and Tonks, with his medical hat on, was at the Royal Free Hospital, and must have known Heald well. The paining has many elements of Orpen's loose and open brush work on his backgrounds, while also representing the face in heavier more detailed oils. A Google Images search will illustrate many such seemingly unfinished portraits. The sitter had the distinction of serving as a medical officer in all three branches of the armed forces during the First World War. After the war he took a keen interest in electrotherapeutics and played a leading role in the development of physical medicine. His papers include a typescript copy of his unpublished autobiography recounting his colourful wartime experiences, scrapbooks, printed matter, correspondence and personal papers. There are five records at the National Maritime Museum of papers donated to them by Heald in 1957 relating to his First World War experience, including letters written to him by his wife and family. Any information about this 'Portrait of an Unknown Rheumatologist'?